Fast forward to three days later and the yarn wraps, though still stiff (so I couldn't style it much except for buns and letting it fall) was less painful. Thankfully my edges were not sore but I lost a bit of hair from the night before (I could see white roots poking out). My edges are really fragile. Fast forward to a week plus a tip from a natural on Intagram to dip the hair in water again, my yarn wraps was beginning to be worth the effort! 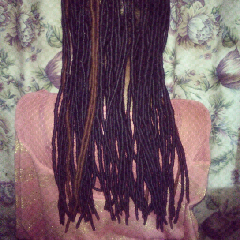 - Your scalp is not hidden unlike weaves so you can easily moisturize, clean and allow it to 'breathe'. - Your hair is completely hidden away from the elements. 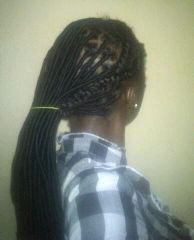 No strands of hair exposed like you'll have in twists or braids. - You can easily hydrate your strands within the yarn/wool because the wool absorbs moisture and holds it in long enough for your hair to have a satisfying drink. So here's what I learnt from my experience. - I think the reason for the pain is that though the stylist tried to braid loosely, when she wrapped, she wrapped it a bit tight from the base. It didn't hurt when I left my hair to fall in the direction she was wrapping ( downward). However when I tried to put my hair up (in a different direction) it hurt so bad. Next time I'll tell the stylist to make the braids and wraps much looser so the base will be much more flexible and won't hurt whichever direction I style. - I will still make square sections. It looks neater, ages better and give your hair some volume if you have fine stranded hair like mine. 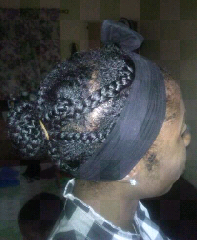 - I will wrap the hair around my edges myself. They are just too fragile. I thought about doing the yarn wraps myself. I even tried to start it but mehn....it's work! This isn't your garden variety twists....the wrapping works the wrists bad (even when you're doing it for someone else) and unlike twists, I can't do a little every day, it'll just look weird. -....my stylist got together two more girls to get the job done quickly...and of course, each person will pull and wrap in different directions and it will hurt in different directions no matter how much you tell them to be gentle.....so just one stylist please.....even if I have to do it over the course of three days! - I have the habit of not really planning out my styling sessions. I only style when I have nothing to do for the day....and then it depends on if I'm in the mood to do my hair. That's the freedom I love about being natural and having healthy hair. On worse days, I can put my hair up in a big bun and I'm good to go! ....but this habit isn't going to work if I want to do yarn wraps again. I'll have to plan a day and go to the salon early! - I was really happy with my decision to make the wraps thinner, fewer and longer. This is because it gave me much more flexibility with styling....even though I only managed to do buns, ponytails and the occasional twisted updo.....but it meant if I really wanted to be creative, there'll be no limits. - Speaking of styling, I noticed that bobby pins were quite useless with yarn wraps. Infact that's when I realized there a limit to loc imitation...lol. If I had real locs, I'd have been able to hold my updos better with bobby pins. So I had to kind of weave the yarn wraps and hold it in place by threading it with either strands of yarn or the yarn locs themselves. All in all, I feel really dope with my locs and will gladly have it in for two months......at least to make up for the bad beginnings...lol! 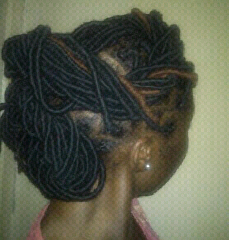 wow my dear you locs look very neatly done and beautiful. and i feel your pain from the experience of making tight rubber thread. i would even rock this hair for three months just keep remaking the edges and washing them.